Siblings share the most special bond. 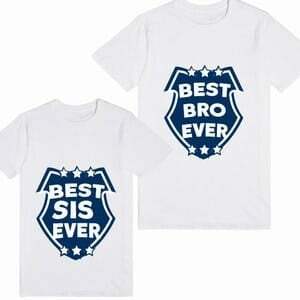 Have them express their bond of love with sibling matching brother and sister t shirts for children. Dress them alike in personalized kids t-shirt designed for baby girls and baby boys. 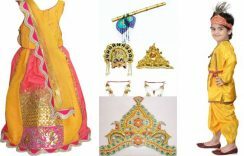 They make a wonderful present to give your sibling on Raksha Bandhan, birthdays, holidays and other special occasions. 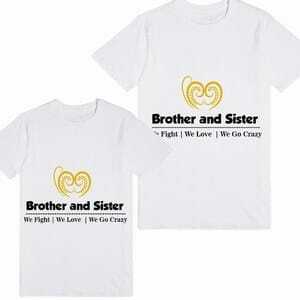 Given below are some lovely customized t-shirts for brothers and sister to dress them same to same. Adorable big brother little sister t-shirts are a cool way to dress and with custom Raksha Bandhan t-shirts, you can be more creative in having personalized matching outfits for brothers and sister in India. Big brother and little sister will look so cute wearing personalized kids t-shirts that can be paired with shorts, jeans, skirts etc. This kind of coordinated clothing makes Rakhi more fun and special and surely makes picture clicking more memorable for everyone. 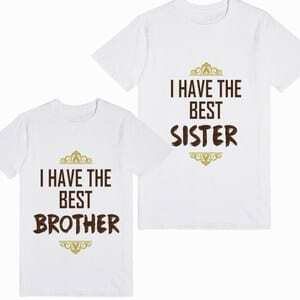 Let them tell the world that they are the best brother and sister ever which this unique custom Raksha Bandhan t-shirt which speaks for their love. Wonderful matching outfits for brothers and sisters that are evergreen just like their love. Sibling matching brother and sister t-shirts for children are probably the most loved present to give on the festive occasion of Rakhi. Buy online pretty personalized Raksha Bandhan t-shirts in India that creatively express the love shared by siblings. 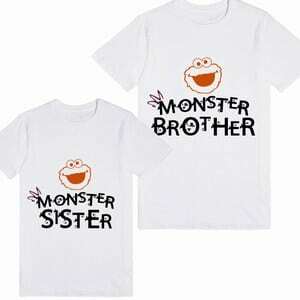 Make it more fun with monster matching customized t-shirts for brothers and sisters to make it a playful Rakhi Festival clothing for boys and girl. 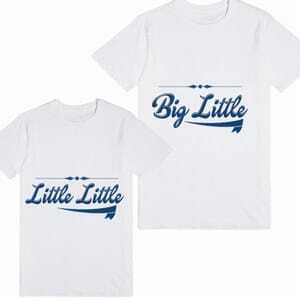 They will look more cute wearing these innovative t-shirts that are personalized for an exquisite look. 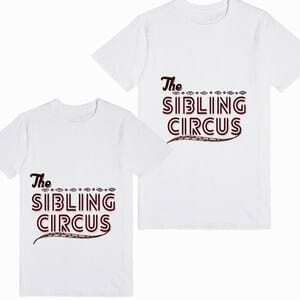 Lovely custom Raksha Bandhan t-shirts that celebrate their bond of love with unique Sibling Circus print on it. They will make a wonderful duo dressed in these matching outfits that have been designed to make it a happy wear for both. 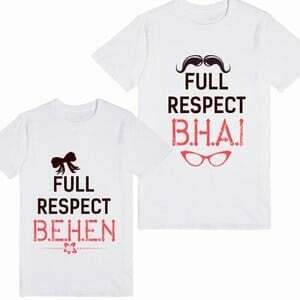 “Full Respect Bhai and Behen” is another wonderful matching outfit which has been crafted with love. The cute t-shirt which not only celebrates their love but also the respect they have for each other. With such darling custom made personalized kid’s t-shirt, you can surely make dressing more dapper. Little brother and little sister t-shirts make a lovely matching clothing to have. 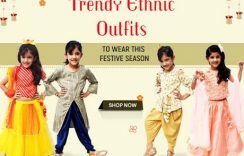 Dress them in a must have coordinated wear which makes not only Rakhi but also holidays and photo sessions so much more entertaining. Show the world the love you have for your brother or sister with “I have the best brother/ sister” t-shirt which is another wonderful personalized Raksha Bandhan t-shirt to shop online in India. Comfy and stylish, this is a cute matching outfit to buy. 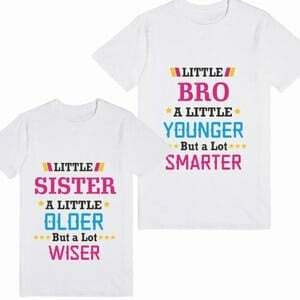 Don’t miss on this sibling matching t-shirt for little brother and sister. 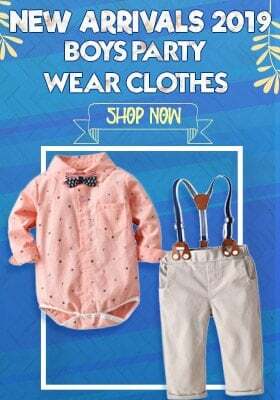 You can have it custom made for your babies to have them express their love wearing these adorable t-shirt sets that have been made for special occasions. With such beautifully designed personalized t-shirts, you can always take your children’s dressing to another level.